If you’re looking for a versatile midsize SUV with plenty of cargo space and enough power for some off-roading and towing, yet it’s still comfortable with your family in mind, look no further than the 2018 Toyota Highlander. Here at Toyota of Newnan, we believe in long-term relationships, and that’s why we’re proud to offer our Lifetime Limited Powertrain Warranty for all our vehicles, new and used. The 2018 Toyota Highlander is a three-row midsize crossover with seating for up to eight passengers. This Toyota SUV offers two engine choices, including a 2.7-liter I-4 that delivers 185 horsepower and 184 lb-ft of torque and a 3.5-liter V6, which pumps out 295 horsepower and 263 lb-ft of torque. A six-speed automatic is the only transmission available with the base four-cylinder engine, and the V6 comes exclusively with a direct-shift eight-speed automatic transmission. Front-wheel drive comes standard in the Toyota Highlander for sale at our car dealership in Newnan, GA, but you can opt for all-wheel drive in certain models. The 2018 Toyota Highlander offers a prime suite of safety technology to keep you safe and secure on the road. 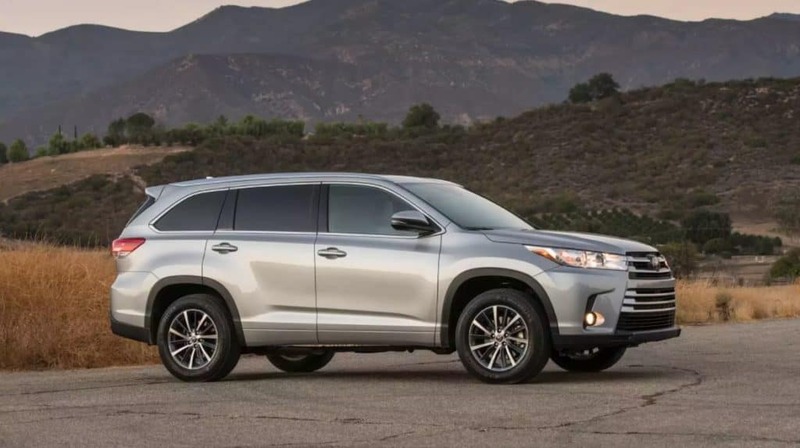 Standard on all Toyota Highlander models is Toyota Safety Sense™ P, which bundles together forward collision warning, pedestrian detection, automatic emergency braking, lane departure warning with steering assist, automatic high beams, and adaptive cruise control. Blind-spot warning with rear cross-traffic alert is available on top trims. Standard features in the Toyota Highlander includes 60/40 split-folding second- and third-row seats, which collapse to provide you a total 83.7 cubic feet of cargo space. With both rows in place, you’ll still have 13.8 cubic feet of storage volume at your advantage. Four tie-down hooks come equipped to secure your items, as do cargo area lights to ensure visibility at all times. When it comes to technology, this SUV offers keyless entry, five USB ports, the Entune™ infotainment system with a 6.1-inch touchscreen, Bluetooth® connectivity, and a rearview camera. Our skilled sales staff at Toyota of Newnan are experts at finding the Toyota car that’s right for you. Come visit us at 2 Herring Road in Newnan, GA, where we can set you up for a test drive in the new Toyota Highlander and answer any questions you might have. Feel free to also check out our other new and pre-owned Toyota models while here, such as the Toyota Prius and Toyota Sienna.